A positive displacement (PD) blower is used to move gas or air in a variety of applications. 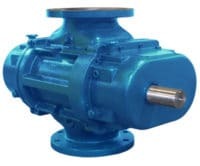 PD blowers use positive displacement by trapping a specified volume of air and releasing it out against the system pressure. The air is usually released into a pipe or hose to move the material or gas to the end destination. Can be utilized in many fields and industries such as Chemical, Dairy, Environmental services, Cement, Lime, Plastic and Resin. Regenerative blowers are the ideal solution for moving large volumes of air at lower pressures or vacuums. Regenerative blowers regenerate air molecules through a non-positive displacement method to create vacuum or pressure. 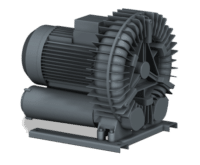 When system parameters fall within the range of a regenerative blower, it can be the most cost effective method for producing pressure or vacuum. The biggest benefit of a regenerative blower is its low maintenance. Regenerative blowers are used in a broad range of applications. These include pneumatic conveying, sewage aeration, vacuum lifting, vacuum packaging, packaging equipment, printing presses, aquaculture/pond aeration, spas, dryers, dust / smoke removal, industrial vacuum systems, soil vapor extraction, and chip removal for engraving equipment. A centrifugal blower uses a fan with rotating impellers to increase the speed of air stream. It uses kinetic energy from the impellers to increase the pressure of the air or gas stream. They are sturdy, quiet, reliable, and capable of operating over a wide range of conditions. They are usually cheaper and simpler in construction than axial fans. They are used in transporting gas and ventilation systems for buildings. They are well suited for industrial processes and air pollution control systems. Busch for vacuum pumps, blowers and systems. Elektor and Fuji for centrifugal and regenerative blowers. Vortron for centrifugal blowers and air knives. 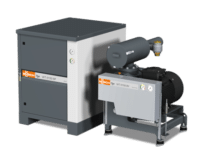 Champion Air Compressors/ Div. of Gardner Denver for reciprocating, rotary screw and rotary vane.